Wrestling has always been considered one of the oldest sports when it came to talking about the Olympic Games. But when it came to the presentation by FILA — before the International Olympic Committee’s general assembly in Buenos Aires, Argentina, Sept. 8, in hopes of remaining an Olympic sport past 2016 — the theme was about creating something new. “We are not a new sport. We are an updated sport,” said Nenad Lalovic, who became FILA’s president shortly after the IOC Executive Board announced Feb. 12 that wrestling would no longer be considered a core sport after 2016 … but successfully led the international federation’s effort to at least become a provisional sport in 2020 and 2024. “Our most persuasive changes were gender equity, equality, new rules and new governance,” added Lalovic, who now has four years to convince the IOC to return wrestling to a core status. 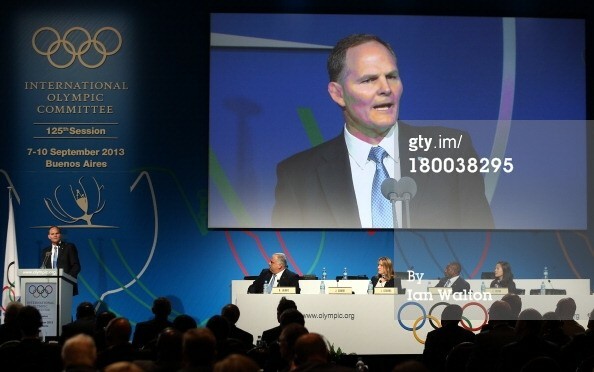 Jim Scherr was among five representatives of FILA to seek wrestling re-instatement to the Olympics during the IOC Congress in Buenos Aires on Sept. 8. And one of the new looks of FILA in Buenos Aires – at least from the five representatives who argued why wrestling should continue — was the fact that an American — Jim Scherr — was literally the left-hand man of Lalovic whose seat among the FILA group was on the far right. The other three members were Lisa Legrand, the vice president of the French Wrestling Federation, Dan Igali, a former wrestler from both Nigeria and Canada and Carol Huynh, a former Olympic medalist from Canada. This was a lot different perception than what many Americans felt about the post FILA leadership headed up by former president Rafael Martinetti, who was forced to resign after the IOC announcement in February. Some have pointed to the new rule changes as an example that the U.S. has put its stamp on a future-looking FILA. Scherr won’t go that far. Scherr was thankful to many people within the American effort to re-instate wrestling on the Olympic level. One of those was legendary American wrestler and coach Dan Gable, who was with his family and friends inside Carver-Hawkeye Arena Sunday morning when the IOC announced that wrestling had received 49 of the possible 95 votes by the IOC Congress. (Among the other two sports, baseball-softball earned 24 votes and squash received 22 votes.) Gable was among the first American wrestling legends to generate support and was aside Iowa governor Terry Branstad during last year’s Iowa state tournament in Des Moines. “I put my head down and pumped my fist,” recalled Gable about his reaction to the latest announcement to save wrestling. Gable, the 1972 Olympic gold medalist and future championship coach at Iowa (where he won 15 NCAA titles), said preparing for this day was similar to when he wrestled and coached. Gable admitted he was nervous about the decision prior to the Sunday morning announcement. Gable also believes that the IOC announcement in February may have come in the nick of time to save wrestling.